To date, nearly $3.4 billion has been appropriated by the Legislature to State agencies implementing GHG emission reduction programs and projects. The State?s portion of the Cap-and-Trade auction proceeds are deposited in the Greenhouse Gas Reduction Fund (GGRF), and used to further the objectives of the California Global Warming Solutions Act of 2006 (Assembly Bill 32 (AB 32); Nez, Chapter 488, Statutes of 2006). 2016 data reported for December 1, 2015 – November 30, 2016. Cumulative data reported since a program’s inception. 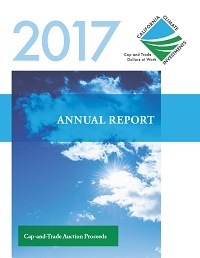 Detailed data are available on the California Air Resources Board (CARB) website, including the program information and specific project location, GHG reductions, and benefits to disadvantaged communities for implemented projects.